Miragreen is a prolific variety of green pea that produces loads of dark green pods and will continue to produce for weeks to come. Each 4-5" pod contains 8-10 plump, incredibly sweet peas with superior flavor. Altogether, it's plenty for canning, freezing, and fresh eating. Or add to your favorite veggie dishes and stir-fries for another pop of color. 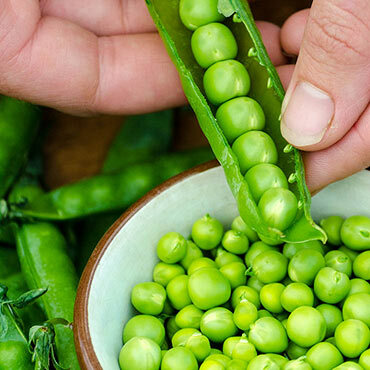 Since they're extremely heat tolerant, Miragreen peas remain tender, green and delicious throughout the entire growing season. Its vigorous, 4' vines require only a support on which to climb. Miragreen pea seeds are treated for faster germination, more vigorous growth and higher yields. 68 days to maturity. Height: 36 - 48 inch vine, requires staking. Spacing: Simply broadcast the seed in the row, allowing the seeds to fall as they may, some even touching. Cover with an inch of soil in the spring; two inches in the summer for your fall crop. Don't thin the pea plants when they germinate. Depth: 1 - 1.5 inches. Days to Maturity: 68 days. Yield: 20 lbs./ 100 foot row. Fruit: Long pods 4 1/2 inches with an average of 8 peas per pod. Seed Count: Approximately 225 seeds per packet., 1/2 lb is approximately 680 seeds. Size: Long pods 4-5 inches with an average of 8 peas per pod.